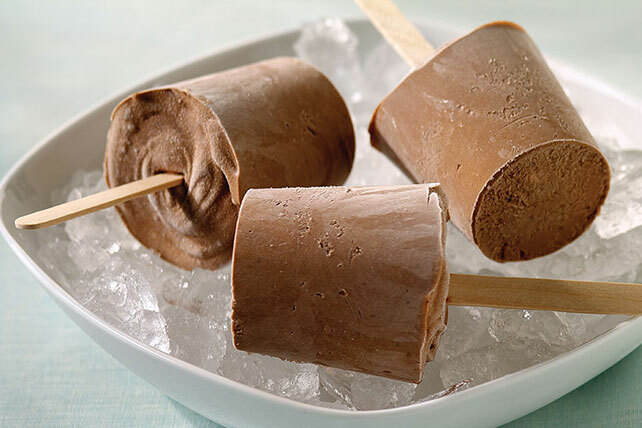 Mask the summer heat with Creamy Chocolate JELL-O Pudding Pops! No need to wait for the ice cream truck when you can make these tasty JELL-O pudding pops. Spoon into 6 paper or plastic cups. Insert wooden pop stick or plastic spoon in center of each cup. Freeze 4 hours or until firm. Remove from cups before serving. Prepare as directed, adding 1/4 cup each chocolate chips, JET-PUFFED Miniature Marshmallows and chopped PLANTERS Peanuts with the COOL WHIP. Prepare as directed, using JELL-O Vanilla Instant Pudding and adding 3/4 cup BAKER'S Semi-Sweet Chocolate Chunks with the COOL WHIP.